In this talk DGMT CEO, Dr David Harrison, shakes up our thinking about early childhood care and education by asking probing questions such as “what is love?” and “how can we harness the power of love to enable children to thrive?” He draws on biology, genetics, chemistry and history to bring us closer to answering the question we are all ultimately asking: how can we make a new society? This talk was first presented at the Innovation Edge, Think Future Conference on 6 November 2017. You can either listen to the talk accompanied by slides on the video below or listen to the podcast if you are driving. If you prefer to read, scroll down for the full text. Good evening. Reframing early childhood care and education – or ECCE for short. My task tonight is to make you gag every time you hear that phrase. Why is it that we take one of the wonders of being human – the exhilaration of a child’s exploration and discovery – and reduce it to four meaningless letters that have no soul? That’s my first task – make you gag. The second is to blow your minds as we prepare to Think Future for our children. I’m using visceral language deliberately, for reasons which will become clearer as we go along. We need to be less sterile and more evocative when we talk about how children learn. The term ‘education’ knocks the stuffing out of curiosity and imagination – and we apply it to children before they even go to school. In general, education has come to mean the imparting of old knowledge, when in fact we should be teaching children to revel in uncertainty – because that’s how we discover new knowledge. What about care, you may say? Care is a warmer word. Yes, but it’s a guarded word too – one that keeps a professional distance from children. We use it because we want to keep our emotions out of it, possibly because of a sensitivity to child abuse. Well, let’s take it back – that instinct that is a far more powerful instrument than care. Let’s reclaim “love” for our children. But I get ahead of myself. Let’s start at the very beginning, where learning starts. The desire to explore and discover is embedded in our DNA. Its nuclear power is activated by the fusing of a sperm and ovum at the time of conception. That fusion triggers a chain of events that rapidly results in a new human being: a person with great potential to thrive and contribute to society – provided that he or she receives the most basic inputs of love, food, safety and stimulation. But many people don’t thrive. It’s a strange thing that despite the relative uniformity of the human genome, the outcome is so variable. Some of that diversity makes us so exciting – with our different talents in music, drama, science, literature. But some of the differences are just unfair: Healthy, sick; rich, poor; literate, illiterate, and so on. The outcome of genetic expression varies across time, civilisations, regions of the globe and within societies – and it begs the question, why? Why are outcomes so variable for members of that single species, homo sapiens? Many of you will be familiar with Jared Diamond’s most famous book, published in 1997, called Guns, Germs and Steel. In it, he sought to answer why some civilisations got to dominate others. In particular, he noted that Eurasian and North African cultures survived and conquered all – through the use of technology (guns) and apparent immunological advantage. The peoples of other continents (sub-Saharan Africans, Native Americans, Aboriginal Australians and New Guineans, among others) have been largely conquered, displaced and sometimes even exterminated. Diamond’s conclusion was that this apparent superiority had nothing to do with genes, but was the accident of climate and geography. Away from the equator, Europe and the Middle East had a dry enough climate to store grain – which meant that nomads could settle down in large numbers and grow crops. In time, food surpluses allowed them to specialize and trade with other regions. They also had higher levels of immunity to certain diseases, because of their high population density, proximity to animals and to trade routes. The sub-title of Diamond’s book is the “Fate of Human Societies”. His analysis helps explain the distribution of power, technology and health and disease across societies, but it doesn’t explain why there is so much variability within societies living in the same geographical area. Income inequality in South Africa is especially in your face. This photo shows the rich and poorer communities of Hout Bay. Let’s put some numbers to that inequality – and inevitably I must speak in probabilistic terms which don’t necessarily apply to any single person. They are more likely to be sick, violent, abusive, and die young. They lack the power, access to technology and often even the physiology to succeed. These deficits are repeated from generation to generation, reinforcing cultures of apathy and fatalism. The antidote to this indifference is real and imminent possibility in life. That’s how you build a culture of aspiration; the will to succeed. But unlike Diamond, we are not looking back at the fate of societies but looking forward to how we can make a new society, where all can deliver on the promise of their genes. Thinking Future, we need to write a new book. I’m calling it Love, Germs and Skill. Let’s take each of those ingredients and unpack them. What’s LOVE got to do with it? Why do some children thrive, despite poverty? What makes them resilient, able to withstand the adversities of life. The American psychologist Ann Masten has reviewed studies of child resilience – children who have through poverty and made it in life – and identified the factors that protect from poverty. At the heart of these factors is love – loving parents, loving grandparents or another loving adult in the life of a child. It’s that sense of being held and loved that is so protective. Masten calls these protective factors the “ordinary magic” that can change a child’s life. So, we come to the age-old question: What is love? And how can we harness the power of love to enable children to thrive? Here’s my definition of love. Love is a primal instinct that sets us free by connecting us. When a father holds his baby and gazes lovingly into her face, his whole body reacts. Hormones and neurotransmitters are released. Among them, dopamine – creating in him a sense of happiness and security and fulfilment. That’s amazing enough in itself, but here come the real mind-blower. When the baby sees her father’s face, mirror neurons in the front of her brain are activated, enabling her to mirror her dad’s thoughts, chemistry and feelings – in many ways, to be him in that moment. Dopamine is released in her brain, which sensitises her to her dad’s voice and language and movements. Dopamine stimulates learning. As she grows, embraced by love, she becomes increasingly open to new thoughts and ideas and her brain starts to draw pictures of its own. She is freed to think and to learn and to imagine – because she is connected, because she is one with those she loves. Love unlocks the promise of the mind. It sets her free to think for herself. I suspect that most of you guessed that the previous slide was not the brain and its connections. 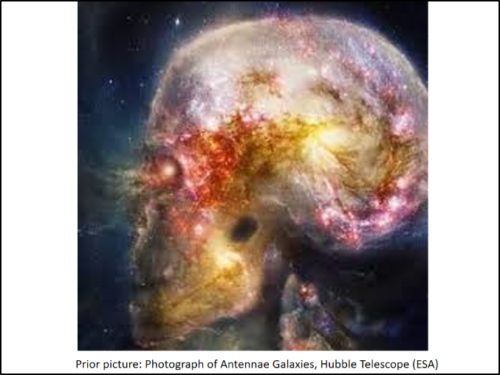 Rather, it is a beautiful photograph taken by the Hubble Telescope of the Antennae galaxies, dancing together in timeless embrace. The interstellar dust that fell onto the earth 4 billion years ago – phosphorus, sulphur, nitrogen, carbon – ultimately formed our own flesh and bones – making us part of the cosmos. Tiny microbes broke down this dust into new minerals that combined into molecules that allowed for complex organisms like plants and animals to develop. These minerals form the basis of human life, our ability to breathe and to move and to think. Love may be just the chemistry of different atoms combined, or it may be a primal force not explainable in purely physical terms. But whether love is a mineral or a miracle, its origins are out of this world. Love has reason, which reason cannot understand, said the 17th Century French mathematician and philosopher, Blaise Pascal. We may not fully understand love, but we do know that children love, to learn. In his book, Pensées Pascal described the simultaneous horror and wonder of teetering between two abysses – the cosmos stretching away beyond understanding and the invisible world of smaller and smaller things – that we now know as molecules and atoms. Little could he know that it was this knife-edge on which he stood – the confluence of the big and the small – the cosmos and the biomolecule – that was the very spot where life formed! Initially life took the form of pretty gormless and lethargic protocells. But when these protocells found ways to store and use energy – life really started to take off. Such was the demand for energy, that some enterprising bacteria decided to specialize as “battery cells”. But it didn’t take very long, a billion years or so, before they realized that the real money to be made in the energy industry was through cell capture. Somehow, a billion years ago, through an event of infinitesimally small probability, some of these battery cells parasitized another primordial cell – and eventually formed the mitochondria of all eukaryote cells today. In effect, we are powered by germs. But our relationship with germs does not end there. Vast numbers of bacteria, viruses, and fungi – known as the microbiome – live on and in the human body. In fact, our microbes outnumber our human cells, and humans are better understood as a superorganism of over 10,000 species. This symbiotic biome is largely transmitted from parents to child. In fact, only about 1% of genetic transfer is human, with microbial genes making up the rest. About half of the hormone dopamine that I mentioned earlier is produced in the gut, as is 90% of serotonin that influences mood, social behaviour, sleep, memory and sexual desire. Do you still want to make that call? In fact, about 30 neurotransmitters are produced in the gut, through the interaction between our microbes – yep, let’s own them – and our specifically human cells. Microbes in the gut modulate our emotions, personality, cognition, and immune system – among other things. In his book Descartes’ Error, Antonio Demasio argues that rationality is shaped by emotion and emotion by bodily senses. In other words, head and heart and gut are one. This view of the integration of body and mind is based on the network of nerves to every part of the body. Now we know that it’s not that our viscera are anatomically connected, but that we are physiologically connected to our germs as well. Global travel has all but eliminated regional differences in immunity. But we are now experiencing new threats. Separation from the environment, a fear of dirt, antiseptics and antibiotics – and even the overuse of Caesarian sections – means that our environmental and intestinal microbiomes are becoming less and less diverse. Immune-mediated diseases – allergies and other chronic diseases and some cancers – are becoming more common. This dysbiosis is the effect of increasing urbanization, exposure to chemicals and the lack of green spaces. I’m not calling for everyone to go roll in the dirt. In the grey spaces of dense informal settlements, gut pathogens predominate – and dysbiosis is even worse – with the result that people are intrinsically sicker, more depressed and more susceptible to chronic disease. I’m calling for green spaces for children, for them to play in the veld, on the beach, in the mountains – because that’s where children live, to learn – and where they thrive. But it’s not just where they learn, but what they learn. If our species is to survive, our children need to understand that they are not masters of the universe, just part of it, like everything else – dependent on our collective ability to live in harmony. I’ve taken you on cosmic flights of fancy about love, then plunged you into the very bowels of the earth‐lings for the movie premiere of “Microbial Me”. Now let me end with where we usually start when we talk about early learning ‐ the brain and its connections to the rest of our body. Brain‐skill formed in the first few years is the scaffold for learning for the rest of our lives. These skills are of language, physical dexterity, our ability to regulate our own emotions, socialize with others, analyse and plan. It’s a bit like climbing the clouds. If you start from the top of a high mountain, there’s more climbing inventory and you’ll reach greater heights. If you start from low down, your chances of cloud‐climbing are slim. Let’s just rub this in a little less esoterically. The basic structure of the brain is formed during pregnancy. During the months and years immediately after birth millions of crucial connections between different parts of the brain are formed. This means that an infant’s brain is particularly receptive to positive influences and learning experiences. On the other hand, it also means that it is vulnerable to the damage caused by a sterile environment devoid of love, support and stimulation. In South Africa, until a couple of years ago, annual national assessments of home language and mathematics were conducted by the Department of Basic Education. This graph shows the results by wealth quintile of schools. It shows that children in the poorest schools (quintiles one and two) already enter school at a disadvantage. These findings point to the fact that major deficits in language and cognitive ability have already accrued by the age of five. The children’s results continue to diverge until Grade 4, whereafter the gaps remain more or less the same size. 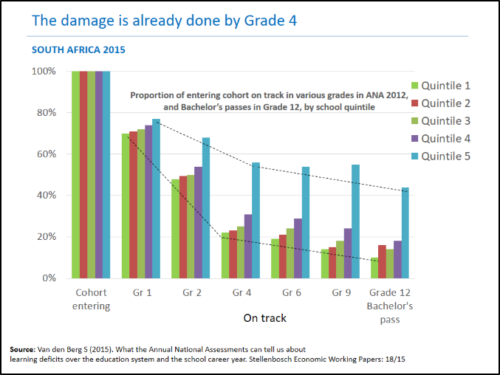 In other words, the major damage is already done by Grade 4. The result is a trickle of skills into the economy at the end of the pipeline. Only one in four workers is classified as skilled – and unfortunately, we’ve not made much headway over the past 20 years. The increase in the national skills base has been relatively small and racial disparities have in fact widened. 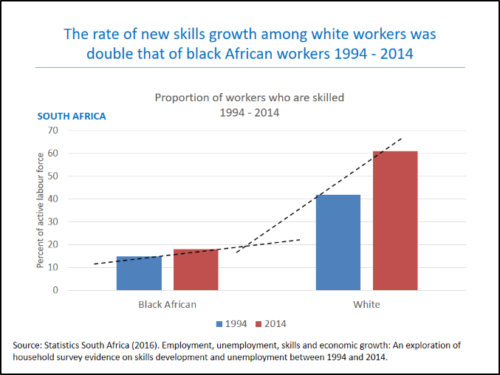 For example, the rate of increase in white skilled workers in the first two decades’ post-democracy was double that of black Africans (a 45% increase versus 20%). Remember that gut-brain axis? Food and brain function are integrally linked. Not surprisingly, it turns out that good nutrition is key to cognitive development, school achievement and adult productivity. It creates physiological capital. The major advances in human productivity in the Industrial Revolution were linked to food. And as workers grew taller, they were able to work better and their incomes increased. A more contemporary five-country longitudinal study found that height at two years of age was the best predictor of adult human capital. In South Africa, stunting rates have not changed much over the past 40 years. That’s children short-for-age because of poor nutrition. What an opportunity to change-future if we could achieve zero-stunting by 2030! Over half of our Grade 5’s cannot read for meaning. The economist Nic Spaull calls that the biggest solvable problem in South Africa today. And only a quarter of our 3-4-year olds have access to quality early learning programmes. I find myself caught between the horror of half our children missing out on these most basic ingredients of life and wonder at the opportunity that such deficit creates. Sometimes it feels like my gut-brain axis is about to explode with rage and excitement at the same time. Imagine if all our children got to experience love and food and safety and stimulation. It would blow their minds wide open. This is the challenge of the Think Future Conference – which we now know is attended by some 200 humans and billions of microbes. May you all be enraged and enthralled over the next two days. And may the diversity in this room come together as one great superorganism to create a better future for our children. This talk I started by telling you of the incredible power released at the time of conception, unleashing a chain of events that ultimately result in a wonderful human being with great potential – provided that the basic inputs are in place. Your genes are powerful determinants of individual talent and ability. In other words, we’re genetically soft-wired. When young children experience sustained stress – toxic stress – their genes become wired to survive in adversity. They become tough and streetwise. When children are loved and nurtured, their genes are primed to thrive, to love learning, to absorb all the benefits that life has to offer. The amazing thing is that this genetic fine-tuning leads to changes that can be transmitted to their children and even grandchildren – helping to break the inter-generational effects of poverty and exclusion. Now that’s how we create a new society. Said‐Mohamed R, Micklesfield LK, Pettifor JM & Norris SA (2015). Has the prevalence of stunting in South African children changed in 40 years? A systematic review. BMC Public Health, 5(1):1‐10.